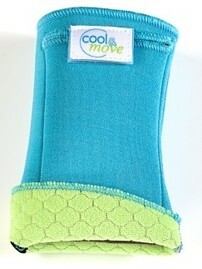 We used select materials to meet the highest standards with our cool&move® bandages. The outer material is made out of a dirt-repellant fabric, so that the cool&move® bandage stays cleaner longer, especially when used outdoors. The core material (not visible) ensures isolation, so that the cold pack’s cooling performance is maintained as long as possible. The inner material, most important for comfort, was selected to be skin friendly and has a unique honeycomb structure. In case moisture develops underneath the cool&move® bandage, e.g. from transpiration, that structure helps channel it away from the skin. Cool-pockets being integrated into the bandage on its sides, on the top for the hand bandage, put the cold packs precisely where they are needed and make them easy-to-exchange.